Covering a vast area of 500 acres, the Angkor Wat is the largest religious monument in the world. It is also the icon and most famous tourist attraction of Cambodia. Built in the early 12th century by Khmer King Suryavarman II, dedicated to Lord Vishnu. 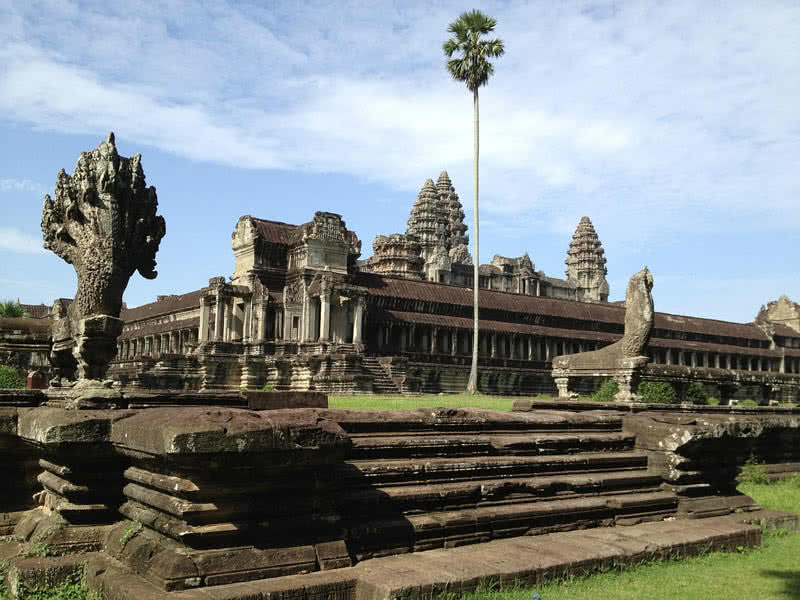 It is said to be Angkor Wat is not only a temple but also a mausoleum. Because unlike other Hindu temples, it faces West, the direction associated with death according to the Hindu beliefs. This temple complex comprises hundreds of stone temples. The enormous stone temple symbolizes mythic Mount Meru, the house of God. The mountain-like shaped temple has five towers to represent five peaks of Mount Meru. A 200 meters wide moat surrounds Angkor Wat. There are more than 3000 heavenly nymphs carved into the wall of this temple complex. Galleries surround the center complex of Angkor Wat. One of these galleries called ‘Thousand Buddha’ is home to hundreds of images of Lord Buddha. 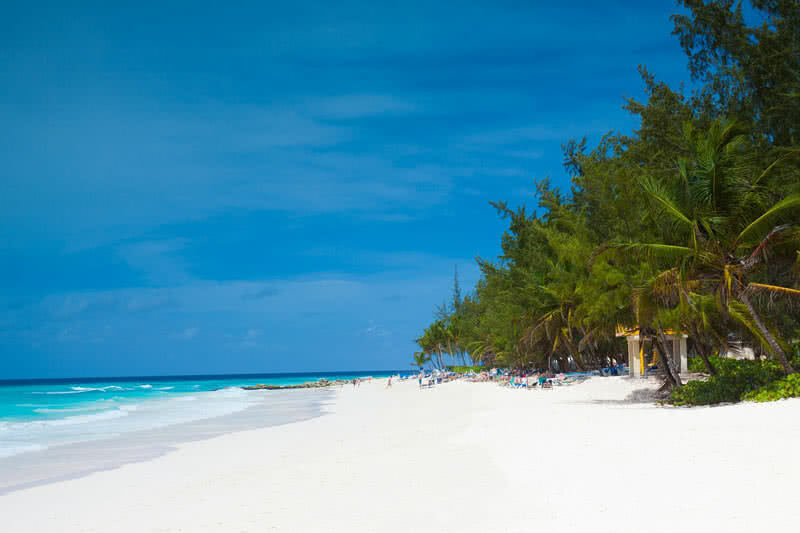 With pristine beaches, pleasant weather, fantastic nightlife, and friendly local people, Barbados is indeed a tropical paradise in the Caribbean. The Island has 60 spectacular beaches with golden sands and clear blue waters. These beaches are perfect for relaxation and to watch stunning Sunsets. Also, you can enjoy various activities including snorkeling, swimming, diving, catamaran cruises, windsurfing, and paddle boarding. No other Islands in the Caribbean have as beautiful coral as Barbados. Scuba diving or snorkeling would bring you the unbelievable view of large coral heads and barrel sponges. Barbados is also home to abundant marine life. You can visit Barbados anytime you like as the Island has pleasant weather year around. Barbados is famous for its unique geological features. The Harrison’s cave is the must visit one. It is a network of caves with beautiful waterfalls, pools, stalagmites, and stalactites. Here are also underwater lakes in the Island, formed by the continuous action of waves over limestone rocks. With unusual varieties of bars, clubs, and restaurants, you can enjoy a great nightlife in Barbados. You can also find resorts that overlooking the Caribbean Sea and Atlantic ocean in Barbados Island. It is an unreal geological formation located on General Carrera Lake in Argentina-Chile Border. It includes a group of cavern and tunnels on huge marble blocks. This stunning marble caves formed by a continuous action of waves on monoliths of marbles. This site has one of the most important marble deposition in the world. The view of lake general Carrera with turquoise waters against the beautiful marble caverns is a great sight that you need to see to believe. 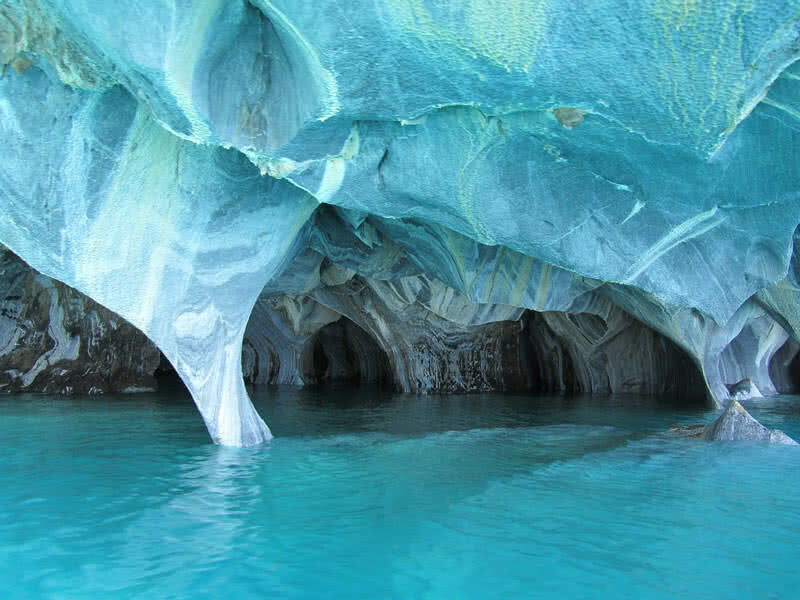 The appearance of marble caves changes by fall and rise of water level in the lake in different seasons. Moraine Lake is probably the most scenic lake in the world. This breathtaking lake located in the valley of ten peaks in the Banff National Park. The brilliant blue to turquoise waters is the main characteristic of Moraine Lake. This attractive color is due to the mixing up of minerals with the water. 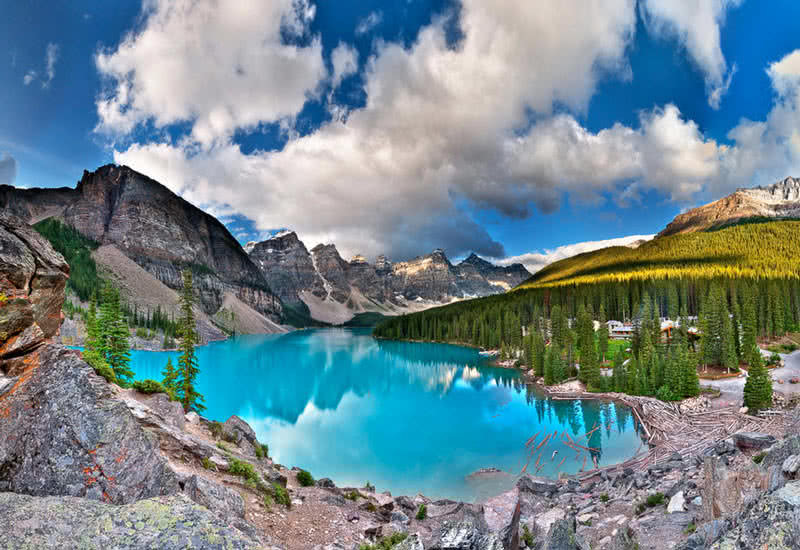 In the backdrop of moraine lake, you can see a series of 10 stunning mountain peaks. This site has more than 100 fantastic hiking trails that offer many scenic attractions. There are lodges in the bank of Moraine Lake. Staying in such a scenic landscape can be an unforgettable experience for you. Canoeing is the most popular activity in the moraine lake. You can also take a scenic helicopter flight over Moraine lake. Spanning 4086 square miles, Salar De Uyuni in Southwest Bolivia is the largest salt flat in the world. This unique landscape contains about 10 billion tons of salt. It looks stunning in both wet and dry seasons. In the dry season, you can see a vast expanse of a hexagonal sheet of dry salt. The shape is due to the crystalline nature of the salt. 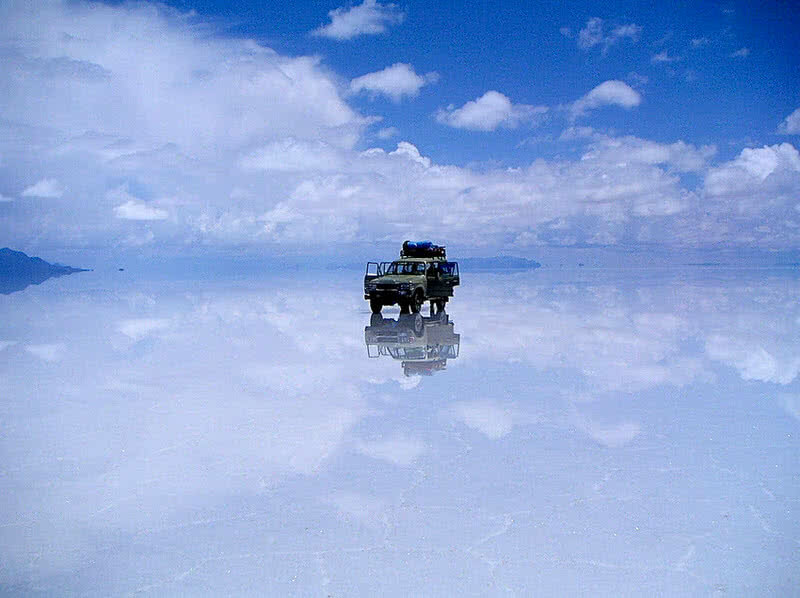 In the wet season, when the entire area covered with clear water, the Salar De Uyuni become the most extensive natural mirror in the world. You can clearly see the reflection of the sky at that time. Salar De Uyuni is exceptionally flat and easy to spot. For these reasons, NASA uses this unique landscape to positioning their satellites. It is a photographer’s paradise. But the exceptional flatness of Salar De Uyuni can cause the photographs to looks distorted. A 4*4 tour across the salt flats is the best way to experience the Salar De Uyuni. It offers a surreal experience for you. 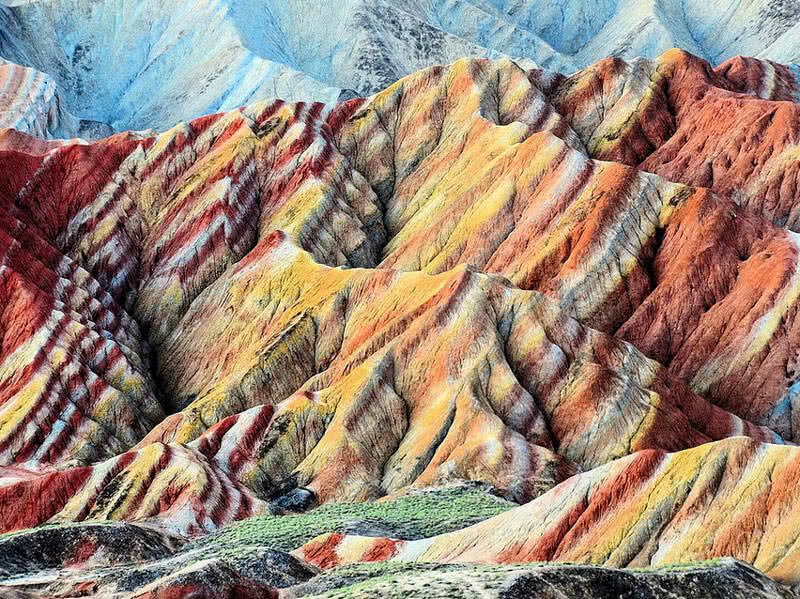 The rainbow mountains of Danxia Landform Geological Park is an amazing geological wonder that you need to see to believe. The high mountains in this landscape have unusual, rainbow-like color. This breathtaking coloration is due to the millions of years of deposition of sandstone and other minerals. June to September is the best period to visit the rainbow mountains. The colors become more clear and bright at that time. The view of this landscape just after the rain is also a great sight to see. At Sunsets and Sunrises, you could see the changing of color pattern in these mountains. The well-maintained viewing platform lets you get a closer view of these amazing mountains. There are also car services to get around the National Park. 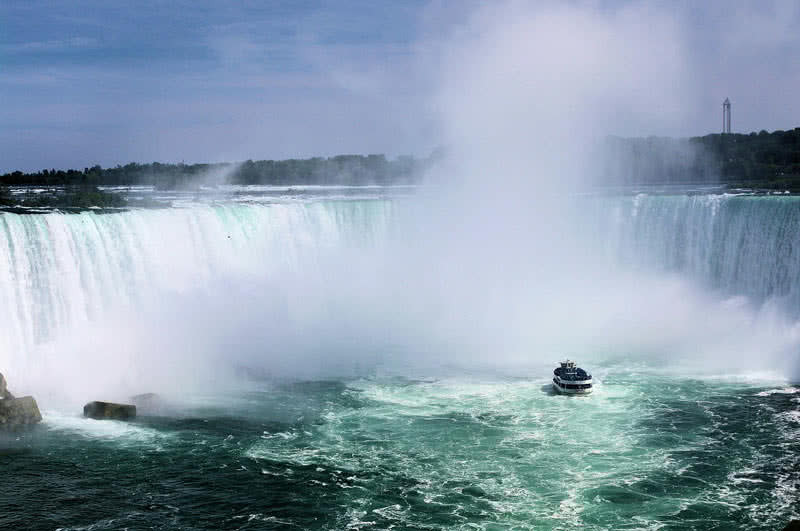 Located between the international border of the United States and Canada, the Niagara Falls is one of the fantastic places to visit in your lifetime. Niagara combines three waterfalls – American fall, Bridal Veil Falls and Horseshoe Falls. The Bridal Veil falls, and American falls lie in the US side, and the most of Horseshoe Falls lies within the Canadian range. The highest vertical fall at Niagara is 165 feet. Niagara produce is a water flow rate of 85000 ft/s. It is the highest water flow rate than any other waterfall in the world. The waters of Niagara have a striking green color. It is due to the mixing up of rock flavors with the water. The natural whirlpool at the Niagara Falls has a maximum depth of 125 feet. The aero car service will offer a fantastic view of Niagara whirlpool for the visitors. The boat ride is a don’t miss activity at Niagara Falls. Apart from a fun ride, you can also enjoy a stunning view of Niagara Falls from a different perspective. At every evenings, the Niagara Falls lit in different colors by Niagara Falls Illumination Board. Santorini is a charming, crescent-shaped, beautiful Island of Greece. Located in the Southern Andean sea, It is one of the scenic, tourist destinations of Greece. The picturesque villages are the main attraction of Santorini. The high cliffs of Santorini lined with beautiful, whitewashed houses. It gives a homogeneity and unique look to the communities. The beaches in Santorini are so unique and charming. Due to the different geographical features, the shorelines of Santorini beaches appears in various colors including black, red and white. The waters of these beaches are so bright and have striking turquoise color. The gorgeous Sunsets are one of the main reasons why people flock to Santorini. 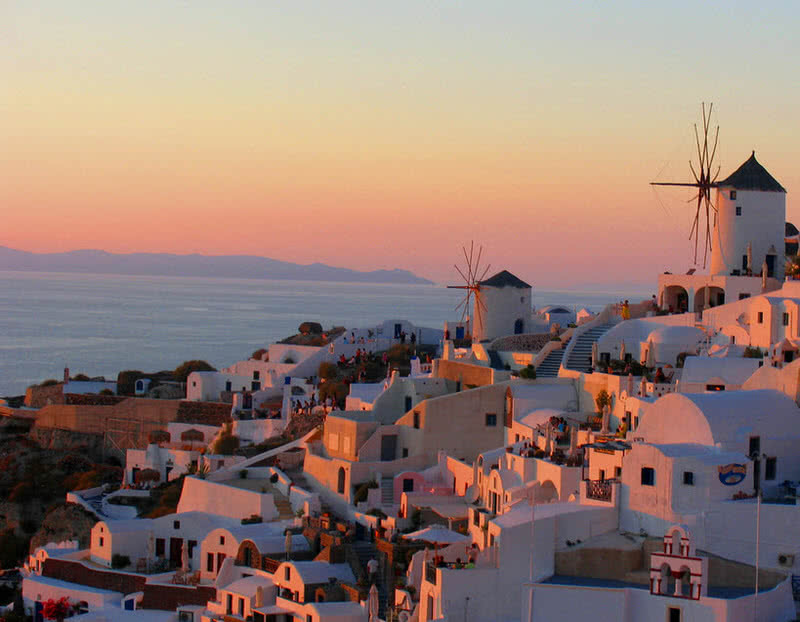 The small town of Oia is the best Sunset viewing point in Santorini. With fantastic beaches, Sunsets and colorful villages, Santorini is also one of the most beautiful places to photograph. Santorini is also home to some of the best wineries in the world. The Great Pyramid of Giza is one of the most significant ancient monuments in the world and the most famous attraction in Egypt. The Great Pyramid is the oldest and largest of three well-known pyramids in the Giza Necropolis of Egypt. It constructed between 2589 B.C and 2504 B.C as a tomb for Pharaoh Khufu. This amazing pyramid rises to a height of 146.5 meters. It was the tallest pyramid in the world for more than 3800 years. There are three burial chambers inside Great Pyramid of Giza. The lowest room carved into the bedrock, the next one is Queen’s chamber, and the third one is King’s chamber. 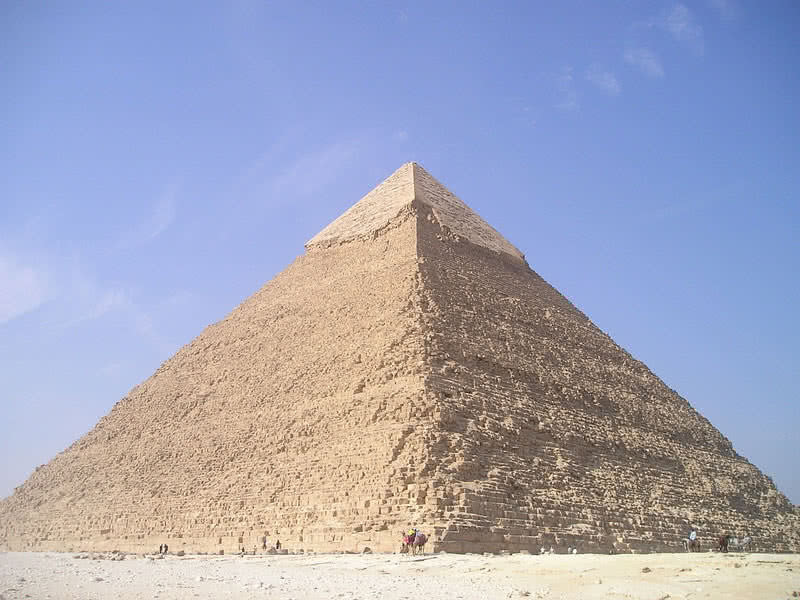 The interior temperature of the Great Pyramid of Giza (20 degree Celsius) is also constant. The mortar used for the construction of the Great Pyramid of Giza is stronger than stone and difficult to reproduce. It’s mixing is still unknown to the modern world. The Great Pyramid of Giza also can be seen from space. The great blue hole is a natural underwater sinkhole located 70 km away from the mainland of Belize. It is the most popular dive destination in the country. The great blue hole is almost circular. It is 300 meters wide and 125 meters deep. This unusual sinkhole is known for its deep blue color that caused by the presence of white carbonate sand and transparency of water. Formed in the ice age by the opening of a dry cave and melting of huge ice blocks. It is a world-class destination for scuba diving. The walls of the Great blue hole is millions of years old. It is also home to some of the amazing marine species including nurse shark, reef shark, and giant groupers. The great wall is the most popular landmark of China and one of the greatest architectural wonders of the Ancient world. It is not a continuous wall. The great wall combines circular walls, parallel walls, and side walls. Different Dynasties of China built the great wall. 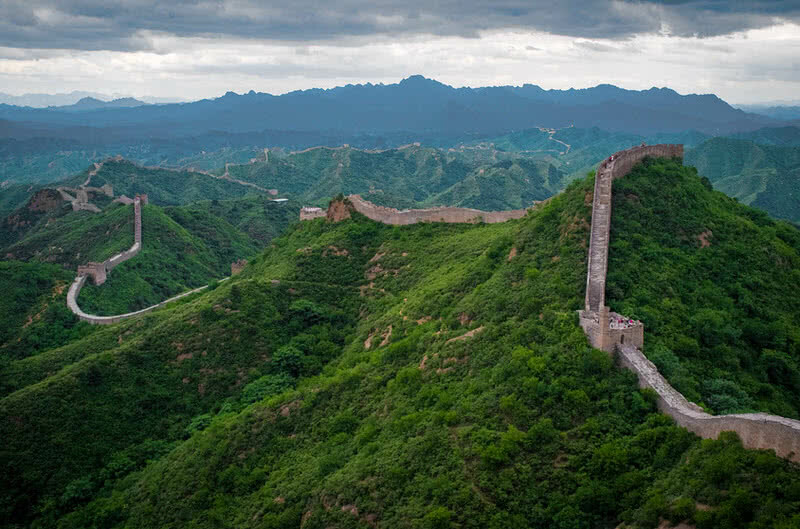 Emperor Qin Shi Huang made the first part of this wall between 220 B.C and 206 B.C. Since then, different dynasties added new sections to the original wall. With a total length of 5500.3 miles, the great wall is the longest structures man have ever built on the face of the Earth. The height of the Great wall ranges from 16-33 feet and also has a width between 13-15 feet. Without aid, the great wall of China is difficult to observe from space. Many parts of the Great wall eroded. Only a few sections of original wall remain today. The Badaling in Beijing city is the most visited section of the Great Wall of China. This section of wall built by Ming Dynasty and also has undergone restoration. Machu Picchu is the ruins of the royal estate built by the Incas located high in the Andes mountains of Peru. It contains temples, palaces, residences, storage rooms, and stone structures. This site covers a vast land of 5.09 square miles. Machu Picchu was built in 15th century by Inca emperor Pachacuti. But after the Spanish invasion, the site was abandoned in the 16th Century. American historian Hiram Bingham discovered Machu Picchu in 1911. Machu Picchu situated at an altitude of 1972 feet above sea level. Majestic mountain peaks also surround the site. The structures found in Machu Picchu carved out of granite rocks. 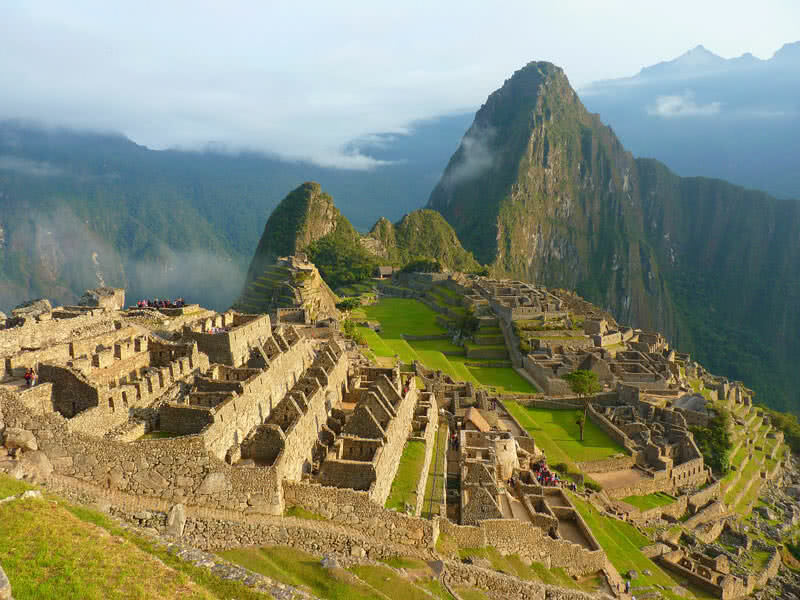 Some of the stones used for the construction of Machu Picchu weighs more than 50 tons. To your surprise, no mortar was used for the constructions of buildings in Machu Picchu. They cut the solid stone blocks so precisely to fit together tightly. In addition to this, the well-crafted stone structures and a sophisticated irrigation system also shows the outstanding engineering skills of Incas. You can reach the Machu Picchu by hiking the amazing Inca trail. It takes 3-5 days for the completion. 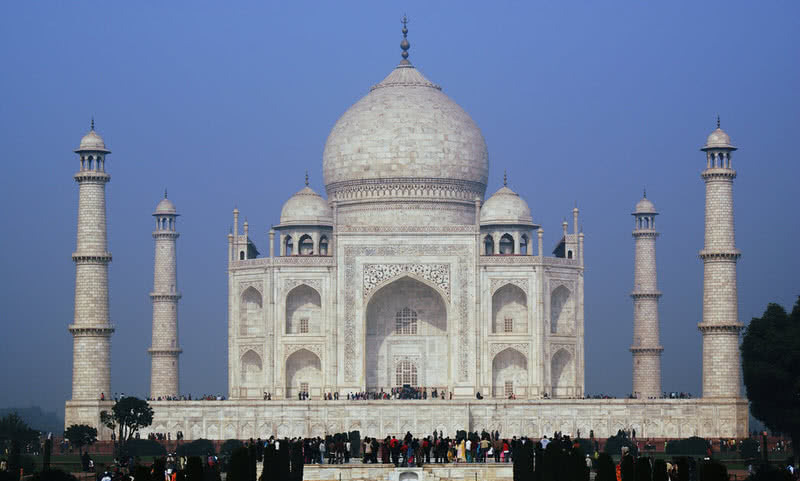 The most famous tourist attraction of India and one of seven wonders of the world. Taj Mahal is the symbol of pure love. This amazing mausoleum was built by Mughal emperor Shah Jahan as the final resting place for his wife, Mumtaz Mahal. The Taj Mahal constructed between years 1632 and 1653. It is the most excellent example of Mughal architecture. The name ‘Taj Mahal’ means ‘crown of palaces.’ This beautiful marble mausoleum has a huge central dome and many smaller domes. There are also four decorative pillars or minarets on the four corners of the Taj Mahal. Taj Mahal has a height of 240 feet, and all four sides of this monument are perfectly identical. It appears in different colors in different times of a day – pinkish at morning, milky white at evening and golden at night. Taj Mahal situates in a vast land of 17 hectares. The site also includes a number of other buildings, a beautiful 300 square meter garden, and a reflecting pool. Bora Bora is the most beautiful Island in French Polynesia. With aqua-centric luxury resorts, beautiful lagoons, friendly locals and fantastic nightlife, Bora Bora is indeed a must visit places in the world. Bora Bora entitled as the most beautiful lagoon destination in the world. This Island paradise surrounded by a breathtaking turquoise lagoon and sand-edged Islets. Luckily, the Bora Bora Island is free from dangerous snakes and insects. 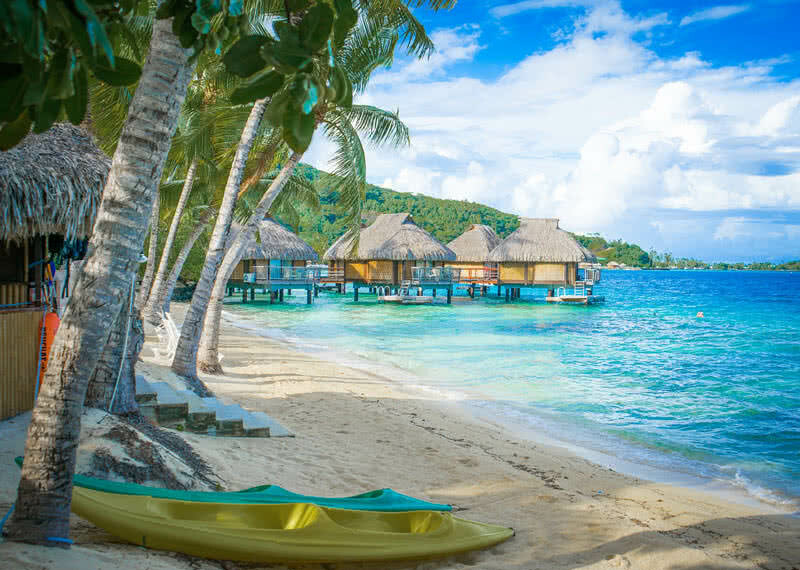 Beautiful bungalows built over the bright, electric blue waters are one of the main attractions of Bora Bora. The private balconies of these bungalows offer a stunning view of the lagoon and Sunsets. Bora Bora is a world-class snorkeling and diving destination. You can swim among more than 100 unusual marine species and can see huge, beautiful coral reefs up close. Besides, you can also enjoy the romantic Sunset cruise, jet skiing, parasailing, kiteboarding and windsurfing. There are only a few public access beaches in Bora Bora. But the Matira beach of Bora Bora indeed among the most beautiful beaches in the world. The white sands, calm and clear blue waters and amazing resorts will make you fall in love with this beach. Antelope Canyon in the Navajo territory of Arizona is the most beautiful slot canyon in the world. This geological wonder is famous for its curved sandstone walls, narrow passages, and striking colors. Antelope Canyon is the most photographed slot canyon in the world. Antelope Canyon has two sections – upper Antelope Canyon and lowers antelope canyon. 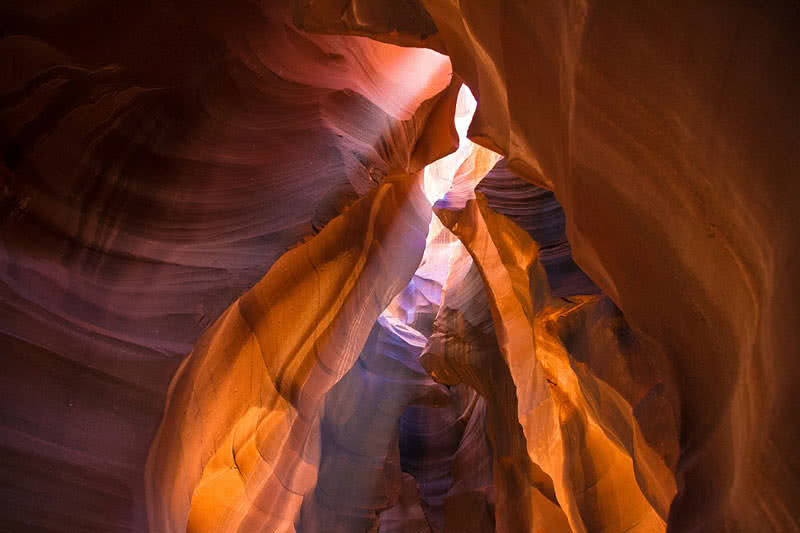 The upper antelope canyon is the most commonly visited part of this site because it is easily accessible. In summer, you can enjoy the fantastic view of Sunbeams coming through the opening above the slot canyon. Lower antelope canyon has stairs along the rock walls to access the site. Unlike upper antelope canyon, the paths of lower antelope canyon are narrower. Still, the incredible rock formations make this site worth visiting. Antelope canyon is prone to flooding in monsoon. So, tourists are not allowed to enter the site that time. Unspoiled by the urbanization, Antarctica is one of few places on Earth where you can enjoy the beauty of nature at its best. 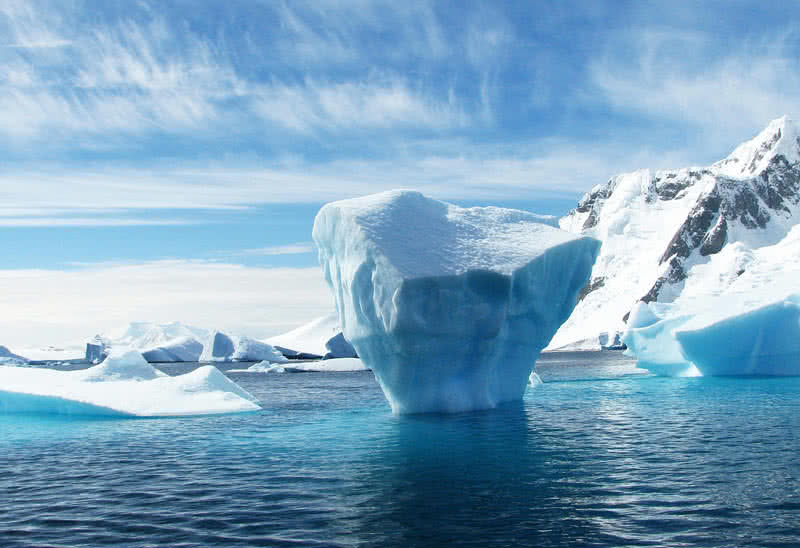 Antarctica is the coldest place on Earth with an average temperature of -49 degree Celsius. Most areas of Antarctica covered with thick sheet of ice. In some parts the thickness measures over 1 mile. Antarctica is home to some of the unusual species of animals and birds. They are well adapted to live in the harsh conditions of Antarctica. Penguins are the most popular animal of Antarctica. There are eight species of penguins live in Antarctica. Upon them, the Adelie and the Emperor penguins are found nowhere else in the world. Apart from penguins, the crabeater seals, elephant seal, dusky dolphin, killer whale, wandering albatross and Antarctic shags are also found in Antarctica. Antarctica is one the best whale watching destinations in the world. Humpback, blue, minke, sperm, fin, sei and killer whales are the commonly found species of whales in Antarctica. Most of the glacial ice of Earth found in Antarctica, and it is also home to many amazing glaciers. About 77000 sq. Km area of Antarctica covered by glaciers. There is almost no activity to match with the kayak excursion in Antarctica. December to March is the best time for kayaking in Antarctica. You can paddle amongst the huge icebergs in the coasts of Antarctica. Australia’s most beautiful tourist attraction and one of the natural wonders on Earth. Comprising more than 3000 individual reef systems and stretches over 1430 miles, the great barrier reef is the largest coral reef in the world. 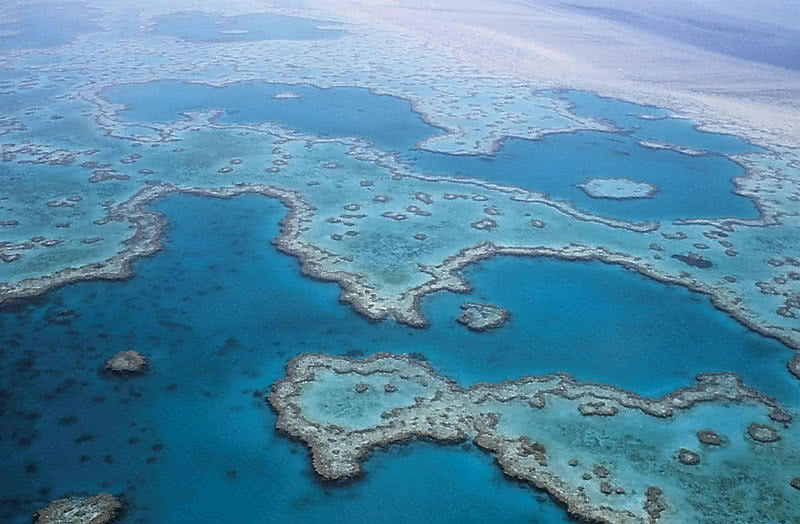 The great barrier reef is the most prominent living structure on Earth that can even see from space. This tropical wonder is home to wide varieties of marine creatures including 1625 types of fishes, 3000 types of mollusks, 133 species of sharks, 30 species of whales and 600 types of corals. Great barrier reef has an unbelievable perfect heart-shaped beach. Take scuba diving or snorkeling to experience the magical underwater world of the great barrier reef. The up-close view of stunning coral reefs will leave you breathless. There are also glass-bottom boats, semi-submersible and sailboats to see the diverse marine life and fantastic coral reefs. Undoubtedly great barrier reef is the most scenic drop zone in the world. Take skydive here to enjoy the most stunning view of the largest coral reef system in the world. There is also seaplane service that offers a magical view of great barrier reef from a different perspective. Perhaps no other place in the United States is as beautiful as Grand Canyon. This breathtaking steep-sided canyon locates in the Arizona State. The 227 miles long, 18 miles wide Grand Canyon is the largest canyon in the United States. It is also one of the seven natural wonders in the world. Grand Canyon features stunning cliffs, multicolored rock layers, and copper colored Colorado river. It estimates that the metamorphic rocks found at the bottom of Grand Canyon are over 2 billion years old. They can reveal much about the Earth’s history. The age of limestone rocks found at the Northern rim of Grand Canyon is more than 230 million years. Five Indian tribes (Havasupai, Navajo, Hopi, Hualapai, and Hopi) have been living around Grand Canyon for thousands of years. Grand Canyon is also a perfect destination for sightseeing, hiking, photographing and rafting. The Havasupai falls located within Grand Canyon is one of the most amazing waterfalls in the world. Surrounded by the multi-colored cliffs, the Havasupai falls famous for its beautiful vivid blue waters and amazing pools. The Grand Canyon Skywalk, a cantilever bridge situated 720 feet above canyon floor offer a stunning view of the cliffs and rock formations in the site. 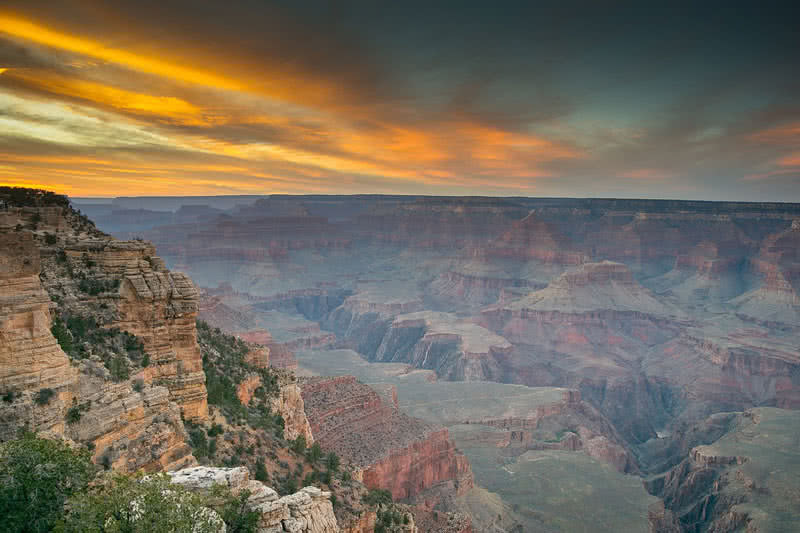 The Sunsets and Sunrises at Grand Canyon appear in vivid colors. It is a don’t miss sight during your visit to Grand Canyon. With the permission from backcountry information center, you can enjoy overnight hiking in Grand Canyon. With unbelievable white sand beaches, magical underwater world and fabulous resorts, the Maldives is indeed a paradise on Earth. 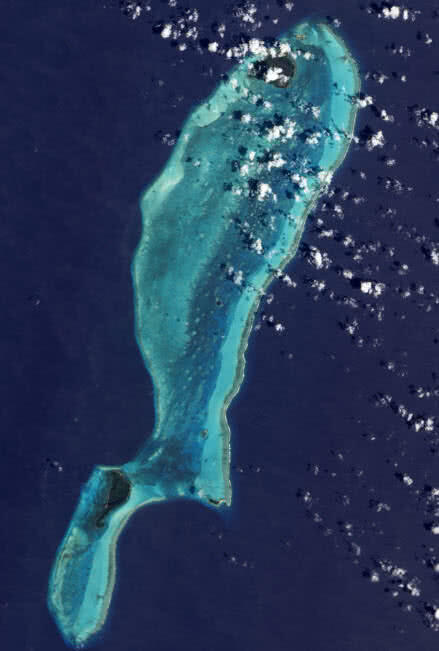 The Maldives comprises 1190 coral Islands. Only 202 of them are inhabited. This amazing Island archipelago has lovely white sand beaches with clearest turquoise waters. You can enjoy the variety of activities on these beaches including parasailing, snorkeling, swimming, and diving. The glittering beach on Vaadhoo Island is a surreal attraction that you need to see to believe during your visit to the Maldives. It is a natural phenomenon, and the mesmerizing shining water is a result of bioluminescence generated by planktons. With an abundance of marine life and more than 70 different species of colorful corals, The Maldives is a perfect destination for snorkeling and diving. Through the crystal clear waters of Maldives, you could view the incredible underwater world of the Island. 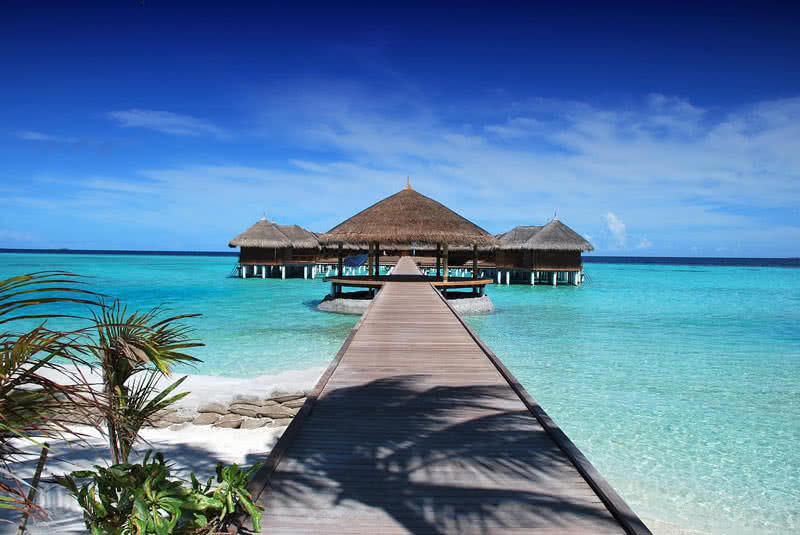 87 Islands of the Maldives exclusively dedicated for resorts. These Islands provides all types of retreats for visitors. You can easily find an affordable resort here. These resorts offer a variety of dining options, stunning view to the beaches, swimming pools, fitness centers, tennis and volleyball courts, and dive centers. There are also underwater restaurants in the Maldives. Ride in traditional Maldivian boat called ‘Dhoni’ is the most joyful way to explore the Island. An evening ride would offer stunning Sunset views. The dive warren Thila is a favorite dive spot located in the Ari Atoll of Maldives. Here you will watch different species of sharks including whitetip reef sharks, gray reef sharks, leopard sharks, nurse sharks, and whale sharks. Take a seaplane flight over the Maldives to enjoy the stunning view natural atoll formations, vast blue ocean, and lagoons of the archipelago! With underwater nightclubs, bars and beach parties, Maldives is also a perfect destination for vibrant nightlife.